Rodney’s work history goes back to high school – back to when he began to live on his own. Over the years, he’s worked in security and in food prep for hotels. Four years ago though, unemployment jumped into the mix. Rodney was left without a job and a home, and found himself in the shelter system. 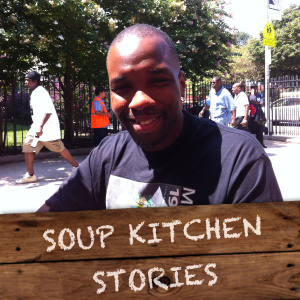 Holy Apostles Soup Kitchen was the first soup kitchen Rodney came to, and he still relies on it as he puts his life back together one step at a time. Last year, Rodney decided he needed to get the kind of training required for a job that not only offers a paycheck, but security and benefits as well. After taking classes and studying hard, he took four tests, earning his commercial driver’s license on December 18th, 2013. “No question about it. If it wasn’t for the soup kitchen there was no way I could even have food in my stomach,” For Rodney, food in his stomach meant he could study, drive, pass the CDL license and start the process of applying for more competitive jobs than he had ever dreamed of having in the past. The most surprising part to Rodney? The amount of hard work, time and negotiation that’s required after one has a license! “Things actually got harder. Most jobs have a lot of applications,” says Rodney. Often times, he had to go back multiple times to speak with different people for the same job. Today, with perseverence and Holy Apostles Soup Kitchen everyday, Rodney is excited about his new job as a school bus driver, which started this past September. “I still need to go through some hoops, get training and learn the routes,” says Rodney, who is hoping to eventually drive for the MTA, a private bus company like Greyhound, or even the Sanitation department. But now, with the help of the soup kitchen, he has faith that his future holds has much to offer.